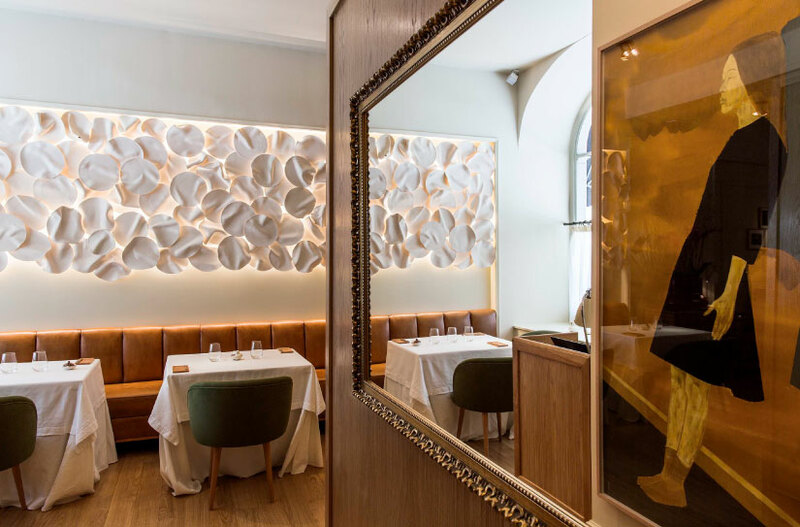 Fire and passion are the hallmarks of Portuguese cuisine, a story masterfully told through José Avillez at Belcanto, Lisbon, Portugal. 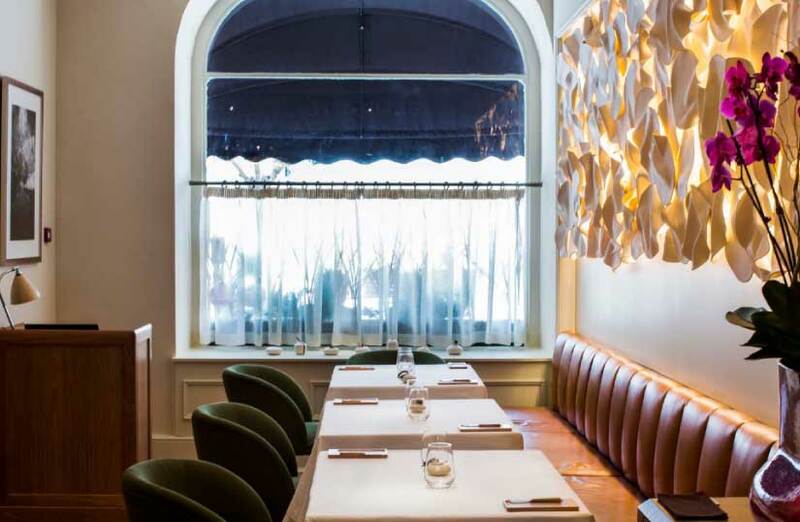 Distinguished with 2 Michelin Stars, 132 OAD Top 100+ European Restaurants 2017 and eighty-fifth place in “The World’s 50 Best Restaurants List”. José Avillez, one of Portugal’s most celebrated chefs, tasting menu runs for around 20 courses, featuring updated takes on traditional Portuguese concepts, like a dish he calls Wave Breaking, which combines a coastal prawn with bivalves, seaweed and seaweed “sand,” and oxtail with chickpeas, foie gras, veal tendons, onion cream and Serra da Estrela cheese. We have been lucky enough to have secured a place on the one and only day our ship is in port. I think the universe has clearly meant for us to be here today. Our favourite way to get to know a new location is to walk. I love feeling my way through unknown streets with no real plan, just instinctively taking this turn or that, inspired by the next glimpse of something new, pretty, interesting. This mornings walk takes us through such a wonderful variety of streets with so much to see. I feel surrounded by a strong sense of colour and decoration, the buildings seem so clearly of this place and this people’s culture. Every surface has been embellished with colour and pattern. Buildings splashed with cheerful yellows, pinks, oranges, blues; or tiled with pretty blue and white patterned tiles feel so happy, like a celebration of life here; of sea, sand and sunshine. 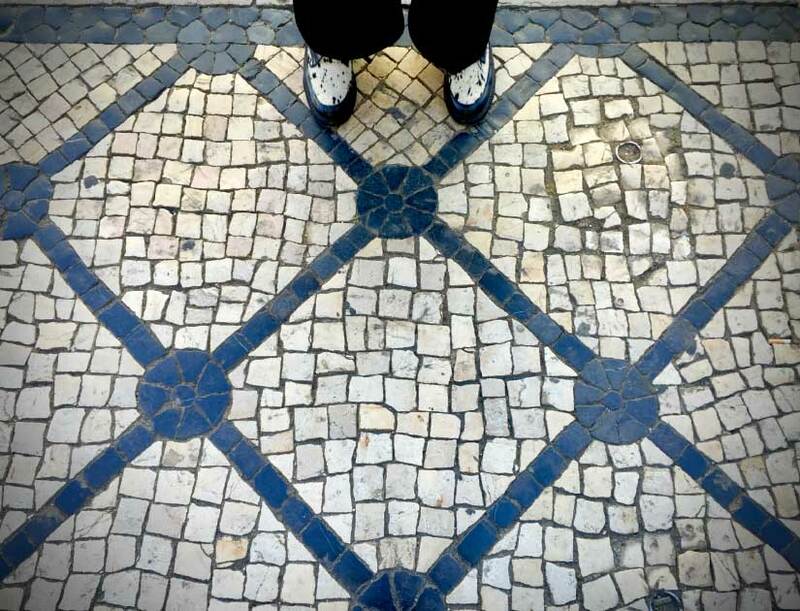 I can’t help stopping frequently to look at my feet standing on the most beautifully designed sidewalks I have ever seen. Old cobbled sidewalks and even sections of roads have been paved in intricate black and white patterns. The surface is shiny creating a glossy enticing trail leading me from one pattern to the next along the way. 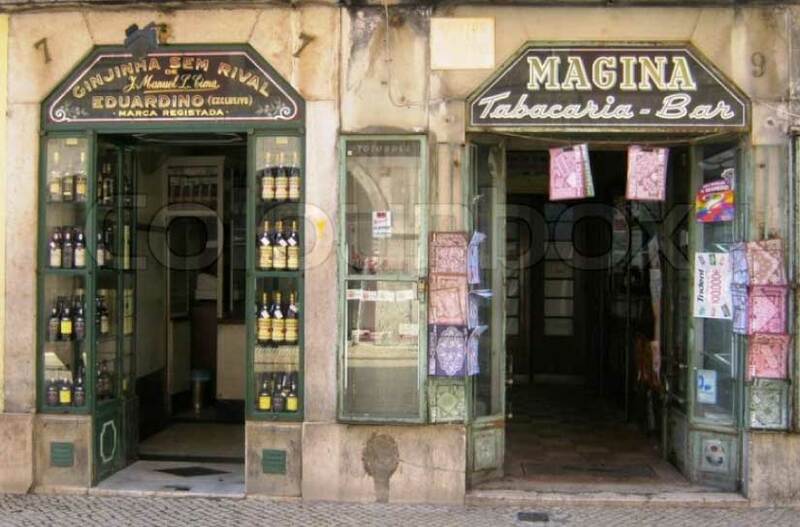 We wander through a lively little square where a little store selling little glasses of Portuguese cherry liquor seemed to be quite popular. Eager to be away from the more busy areas we duck into a tiny little lane between pretty old buildings. It turns out to be the beginning of a marvellous little adventure. The narrow streets wander up and down steep hills up, several side lanes so steep they have colourful little trams, red ones and of course yellow ones to take people up and down. But with our spirits lifted the walk seems easy, daydreamy. Eventually we have to think about checking if where we are going is actually in the right direction for our luncheon booking. Today is very special, something that my love has had planned for a while, so today is not a good day to get lost! 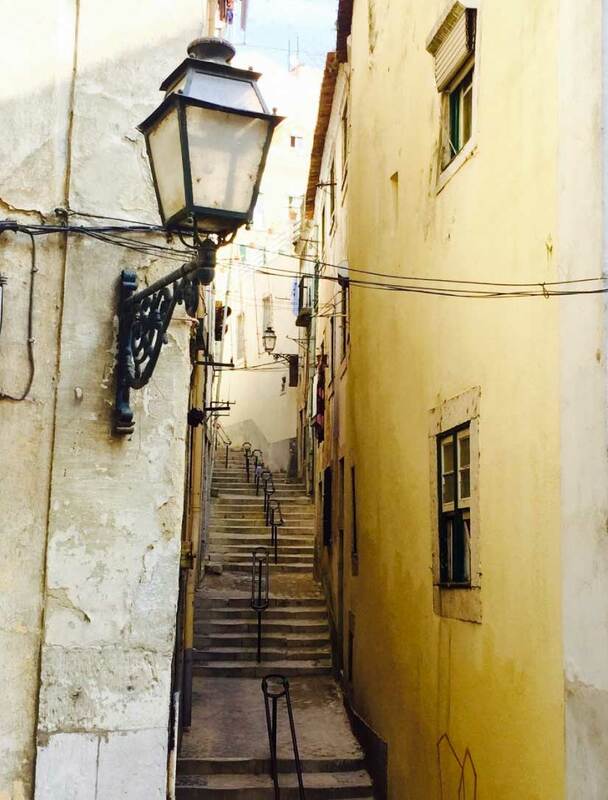 We get our bearings and continue on in the right direction, up and down through more steep narrow pretty streets, sometimes climbing long curved steps up a hill other times down steep stairs. 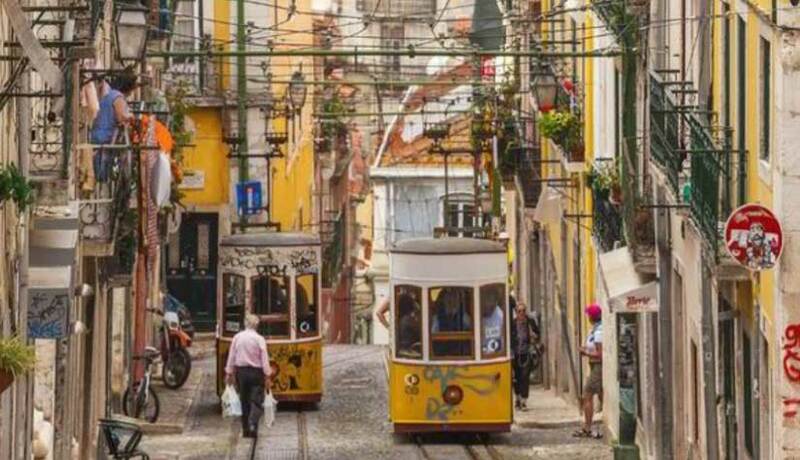 Eventually we emerge onto a little shopping street with lovely design shops, shoes and Jewellery stores filled with deeply rich coloured portuguese gold filigree pieces. Portuguese gold is the highest purity in europe, 19.2 carats giving it a unique warmth. Each piece of traditional filigree is a work of art. I so wish I had bought something, oh well, it just means I will have to come back! Down a side street, off the shopping street, we find a lovely peaceful little square and our restaurant Belcanto. We are a little early so sit under a tree in the square and cool down from our walk. Finally it’s time and we head across to the little understated awning shading the entrance. Inside, one of the first things we notice is a large fascinating whimsical painting of a young girl in a black dress, I love it. The space is warm and inviting, creamy iced coffee flavoured walls and simply dressed tables, only ten of them. 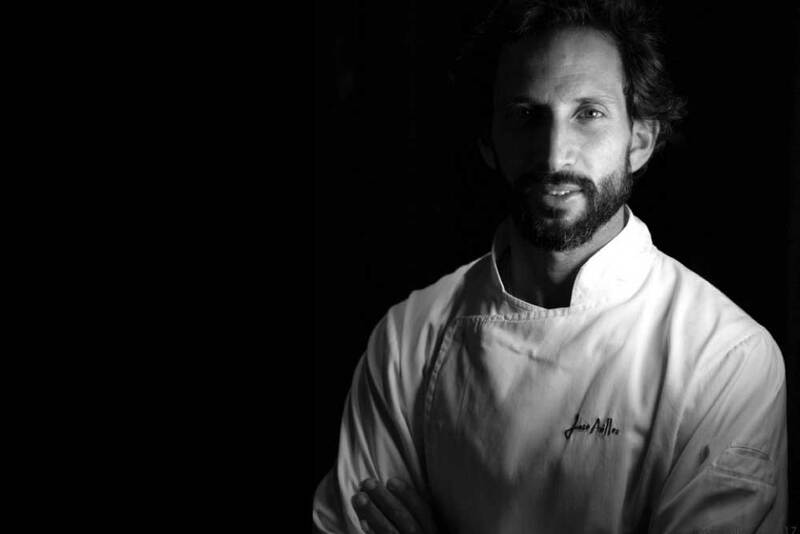 Chef Jose Avillez prepares two Michelin star meals for only a few select diners. We feel so lucky to have a place at one of his special tables. 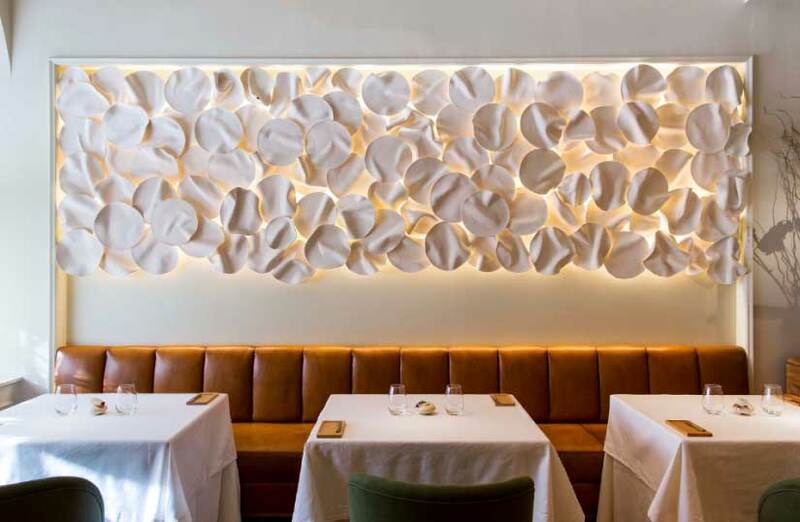 We are seated below another fantastic artwork, a collection of creamy clay plates that have been slightly crumpled and then layered on top of each other and back lit to make a vast work that decorates and illuminates the wall. It is very cool, I like it a lot. I am so inspired by Jose’s deep and considered expression of his intention for the food he is about to present. And I love that at this point we don’t have a menu, I am so excited about the surprises that are to come. And the journey through Portuguese history and cuisine begins with Lupin bean. Now this is one of those ingredients where it is easy to scratch your head and say why? Incorrectly prepared this bean is actually rather toxic and bitter, the Portuguese figured out that soaking the little buggers reduced the bitterness and made them considerably less poisonous. Apparently incorrectly prepared lupin beans may leave you with dilated unresponsive pupils, confused with slow thought, disorientated, flushed and with slurred speech. Mmmm sounds like a regular morning to me! A cool cube of stone is set before us with a little spoon with not much of a handle, balanced in an indent of the stone. Within the bowl of the spoon is a creamy sphere resembling the Lupin bean. I slide the little morsel into my mouth and wow! A distinctly beany flavour fills my mouth but with such a light creamy texture. It is absolutely divine. My disorientation afterward is definitely only excitement! Our server introduces carrot and garlic as he places a tiny clay bowl upon the table. One little ring of carrot and a clove of garlic is what we see but popping each into our mouths we realise it is an illusion. More cleverly created spherification of the pure essence of the ingredient, intensified and presented as a spectacular homage to the simple perfection of the real thing. More little spoons with barely a handle, this time balanced on a section of tree branch and bearing the spherified essence of an olive. Perfectly olive green and a fantastically grassy, salty explosion of green olive. After this collection of gorgeous vibrant pure tastes our palates are vibed up and ready for more. A little rectangular earthenware dish is next, filled with what looks like river stones and moss. Cod liver stones with trout roe. Childhood memories of cod liver go straight to that oil that used to be administered by the tablespoon-full, stinky and fishy and a test for the gag reflexes. This dish is another whole thing. First of all it looks so pretty, the bowl full of pebbles has a very calming relaxing feeling about it. Each of the white stones has a little pile of golden glossy trout roe on top. And popping one into my mouth reveals a beautifully creamy cod liver mousse, with the little salt pops of intensity from the roe the perfect seasoning. Cod is a very important ingredient in the Portuguese cuisine and this dish honours it in the most divine way. Our server brings a beautiful little pot with a flower arrangement to decorate our table. It is delicate and pretty with pink and white flowers and layers of vibrant greenery, how lovely! But it is more than a centrepiece, it is actually our next dish – Azorean tuna “bouquet”. Once they have been pointed out we pluck little cone shaped sushi rolls from within the flower arrangement. The delicate raw tuna from the Azores a Portuguese archipelago in the mid-Atlantic, is just exquisite. Next a little clay pot filled with dried corn kernels, these are not to eat. It’s the little discs on top that are are the most wonderful surprise. Roasted Chicken and maize cream, our server explains and yet there is not a chicken to be seen. It all makes the most perfect sense when I pop the small round disc into my mouth. The disc is crispy intensely roast chicken flavour and is topped with sweet creamy blue corn puree and studded with a few tender yellow corn kernels. This dish is the epitome of simplicity and yet incredibly complex. Here Chef Avillez celebrates corn the “wheat of Portugal”. Goose barnacle and seaweed soup with pickled green strawberries is our next plate. What on earth is a goose barnacle? Is it some parasitic thing that lives on geese? No, turns out it is a Portuguese delicacy, a type of crustacean, named for its long neckedness, so more of a goose necked barnacle. It is a bit particular in terms of where it lives and one of the few places it is found and harvested is on the Southwestern Portuguese coast. It has a deliciously sweet flavour and a kind of al dente texture, bathed in a wonderfully salty rich broth and balanced with a zingy fresh pop from the pickled green strawberries it is a very exciting dish. Can you imagine a stone that has been honed by hundreds of years of tidal water flow gradually smoothing it into a shallow bowl. That’s what I imagine when I see our next plate. On our little stone plate are small slices of smoked and cured red mullet with a fresh bright watercress emulsion – smoked mayonnaise and seaweed. Red mullet is a very distinctive fish and one that I very much enjoy. Smoked and cured this fish is exquisite and seasoning with the peppery watercress and salty seaweed really accentuates its flavour. The rich creamy smoked mayonnaise balances each bite beautifully. Fish is one of the essential elements of the Portuguese diet and Lisbon red mullet is a traditional favourite. The mullet caught near Setúbal in estuaries where the river meets the sea is particularly sought after and a special inclusion in our meal. 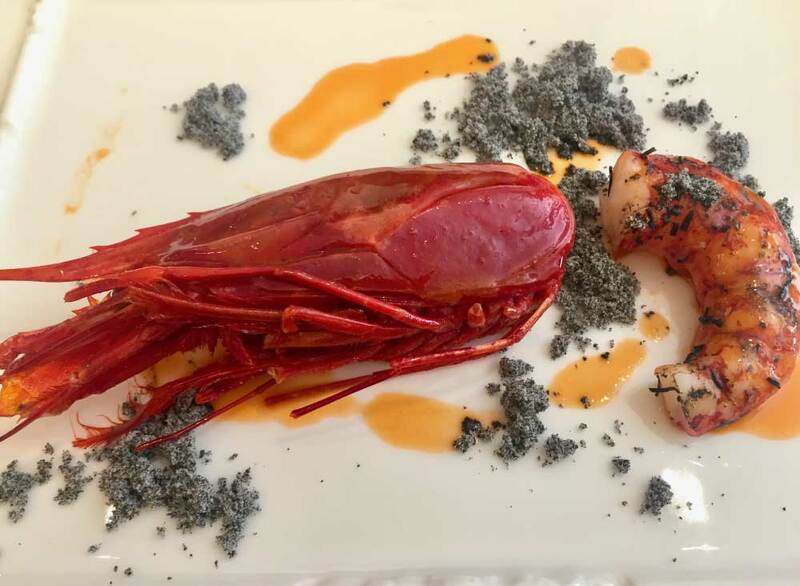 Carabineros, giant red shrimp, live deep in the Mediterranean Sea and are beautiful sweet flavoured things far more complex than a regular prawn. Chef Avilliez has let loose with stunning, abstract painting inspired, plating for this dish. The head of this vibrant red prawn is on one side of the square white plate and the shelled tail is on the other. In-between, the plate is splashed with daubs of red and sprinkled with rosemary ashes, the result is stunning. The rosemary ash sprinkled across the plate it is visually perfect but more importantly the flavours are mind blowing. I would have thought that rosemary would be too big a herb for seafood. Ordinarily I would think beef, lamb, venison, fatty gamey meats as the best marriage for rosemary. But the robust flavour of the Carabineros totally stands up to the smoky fragrant rosemary ash. Simple so simple, just the pure essence of the ingredients is mind blowingly good. Our next plate – Clams and cod “xerem” is a wonderfully comforting dish. Xerem is a Portuguese cornmeal. This one has that earthy and fantastically creamy, slightly sweetness, that you look for in cornmeal. And then beautiful white tender salt Cod, again a celebration of Portuguese tradition. The foundation of this dish was the sense of homestyle comfort food and then little shiny spheres of clam that popped as I ate them releasing the most exquisite flavour bursts lift the entire dish to another level. Simple clean flavours are the perfect thing to follow on with. A simple piece of Sea bass sandwiched between shreds of red king crab and bathed in a gorgeous broth is superb. The sea bass was perfectly cooked, moist and tender. The sweet crab meat was the perfect balancer for the rich, buttery,’steak of the sea’ feel of this fish. A light sprinkling of jerusalem artichoke and tiny peas adds a perfect textural element. A deceptively simple, elegant and very clever dish. Portuguese “pot au feu” sounds intriguing. A pretty little earthenware bowl, with a glaze that reminds me of a shell, holds a selection of tiny veggies; baby carrots, shallots, cabbage. Our server pours a beautiful clear golden broth over the vegetables and it is only then, as the colour of the broth changes, that we realise that there was a little cube of beef marrow hiding under the vegies. It melts with the addition of the broth, to make a rich, deeply flavoured dish. The vegetables are stunning. So simple, every ingredient speaks very clearly of its pure essence. The combination though is more, so much more. The final savory plate arrives, “Cabidela” Oxtail and smoked eel. Cabidela is a traditional Portuguese dish that usually uses poultry or rabbit cooked in its own blood. This one is Oxtail and just when I think the incredibly tender and rich meat is it, I discover rich Foie Gras in the middle of the oxtail. Dressed with a beautiful earthy beetroot jus and accented with a square of smoked eel and a few peppery nasturtium leaves, this plate has to be one of my favourites and such a brilliant crescendo to the savory concerto. Now we move gently into the final act, dessert. Peach and pumpkin is the perfect transition. Peach sorbet that is not overly sweetened, I just love it. As someone who is more of a savory person I can often take or leave deserts, but this sorbet has captured the natural sweetness and sharpness of the fruit and somehow intensified that wonderful flavour unique to stonefruit. Little pumpkin crisps are simply the perfect accompaniment. Mandarine, that says it all really. A pretty leaf green plate is set before us. The contents of which are at once simple and extravagant. A brilliant orange sphere, the mandarin, bright green leaves and a rich citrusy quenelle of sorbet. The mandarin is a light vibrant mousse with a bright jelly coating. Visually it is stunning and more importantly the flavour is so fresh and vivid. The sorbet is cold and intensely flavoured and lifts the mousse to such an exquisite level. We finish our meal with a little handful of Petit fours, tiny tasty morsels. And we nibble them I am lost in thought. 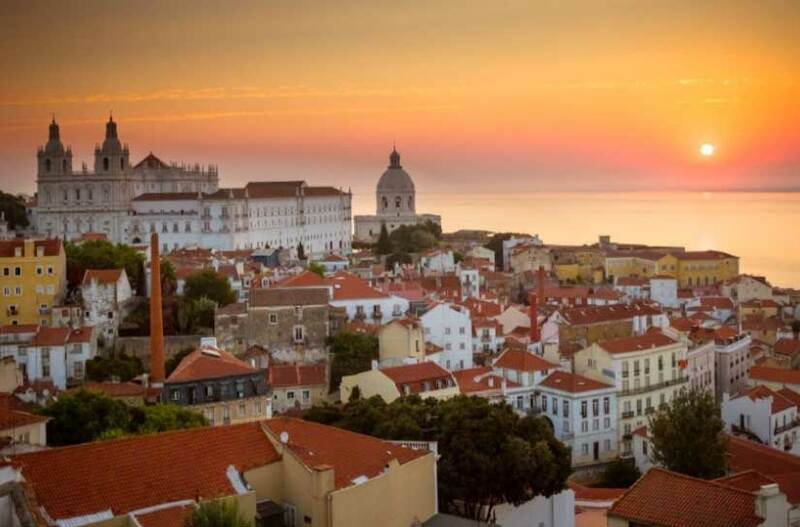 Somehow through his expression of the Portuguese cuisine, Chef Jose Avillez has not only strongly connected me to Portugal’s soul but centered me, aligning to my inner source in the most exquisite and powerful way. I have felt his connection and intention in every plate, it has been a delicious and profound experience. Portugal, Lisbon, Belcanto and Chef Jose Avillez are now embedded as a part of me. A day I will treasure and call upon for inspiration forever.